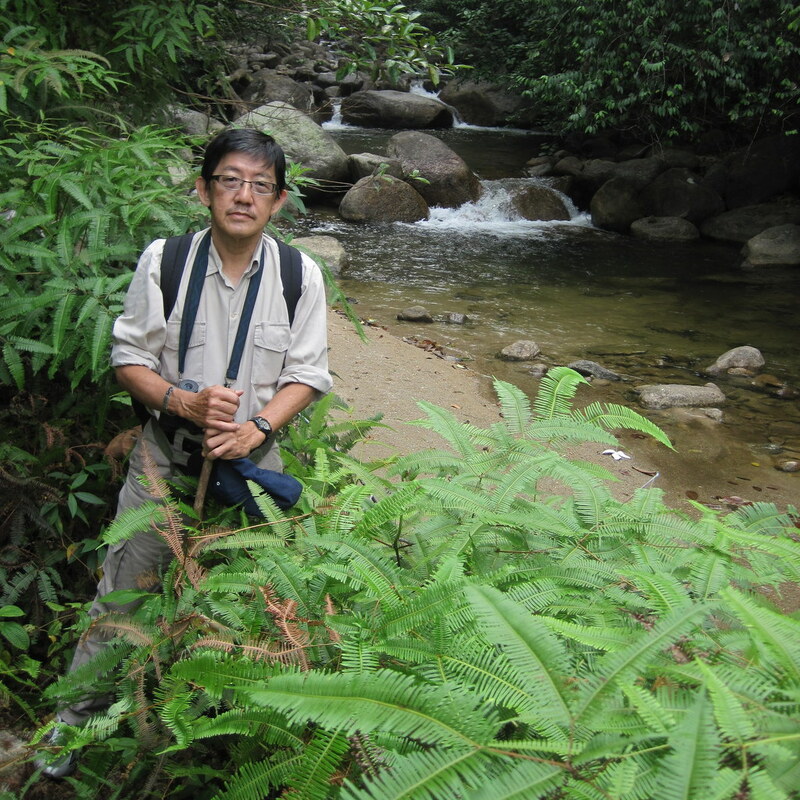 Here is a nostalgic report about two waterfall trips, made with my friend George Tan, in 2009 and 2011. 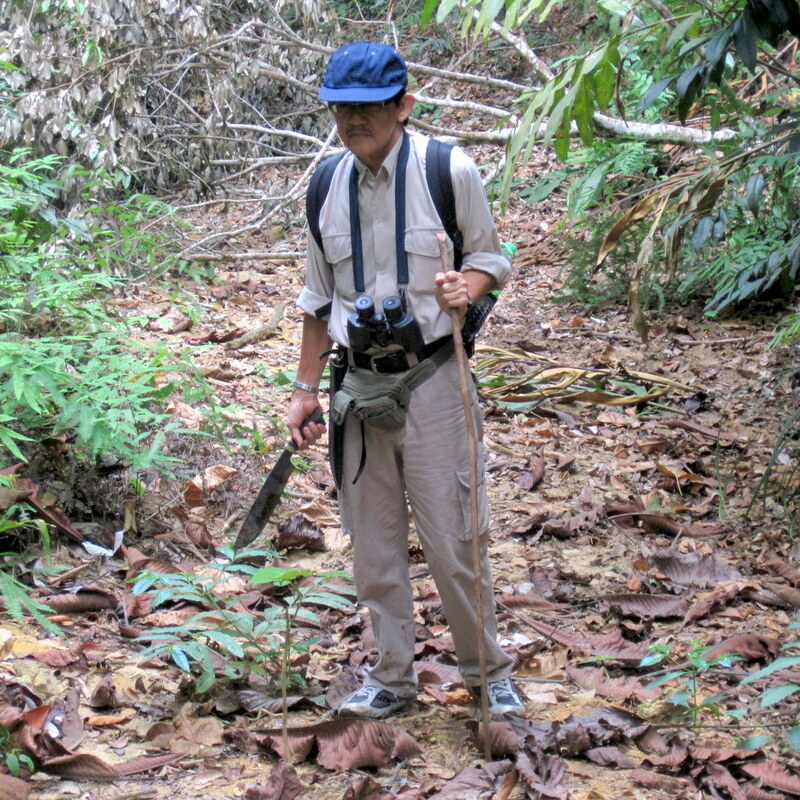 During a recent visit to Taiping I talked with Jenny, a mutual friend, about these trips, she thought it had been irresponsible for two senior citizens to venture so deep into the jungle on their own. And although everything went well, in retrospect I think she was right. 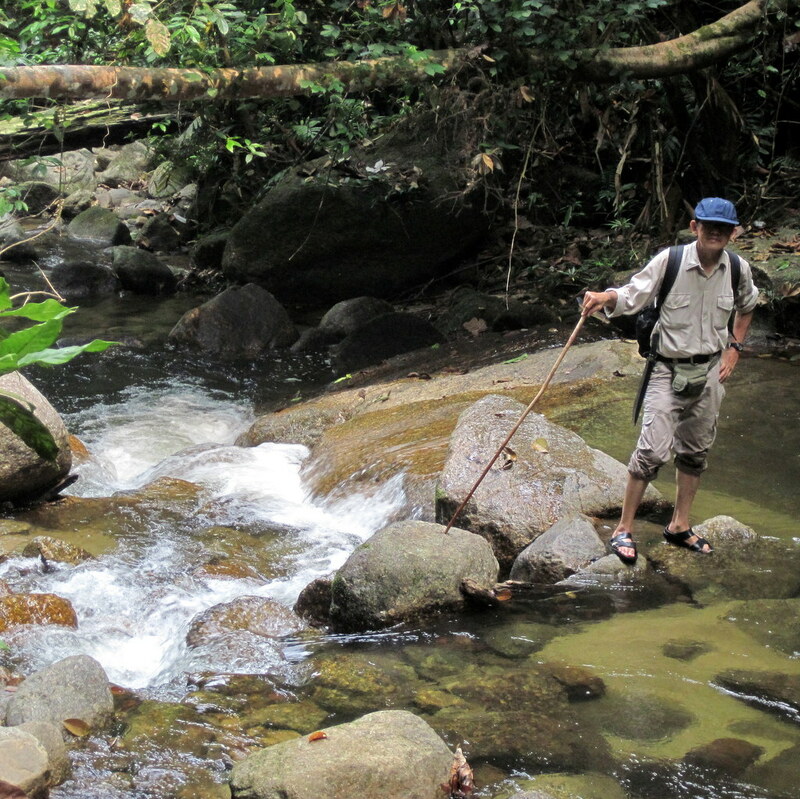 We followed a clear trail high above the river, but to reach the waterfall we had to scramble down a steep slope. 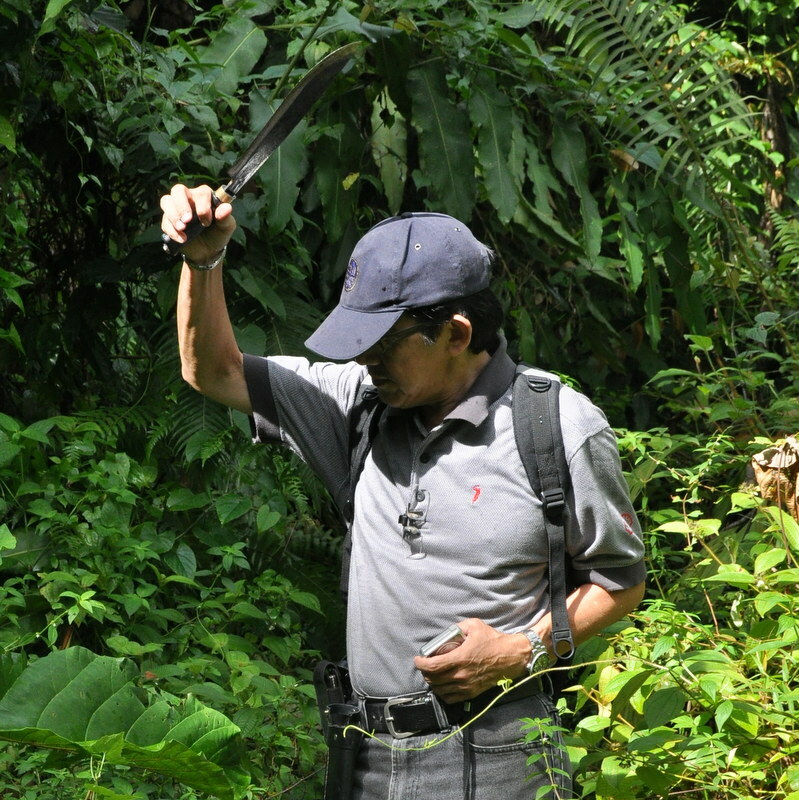 A parang came in handy and George knew how to use it. 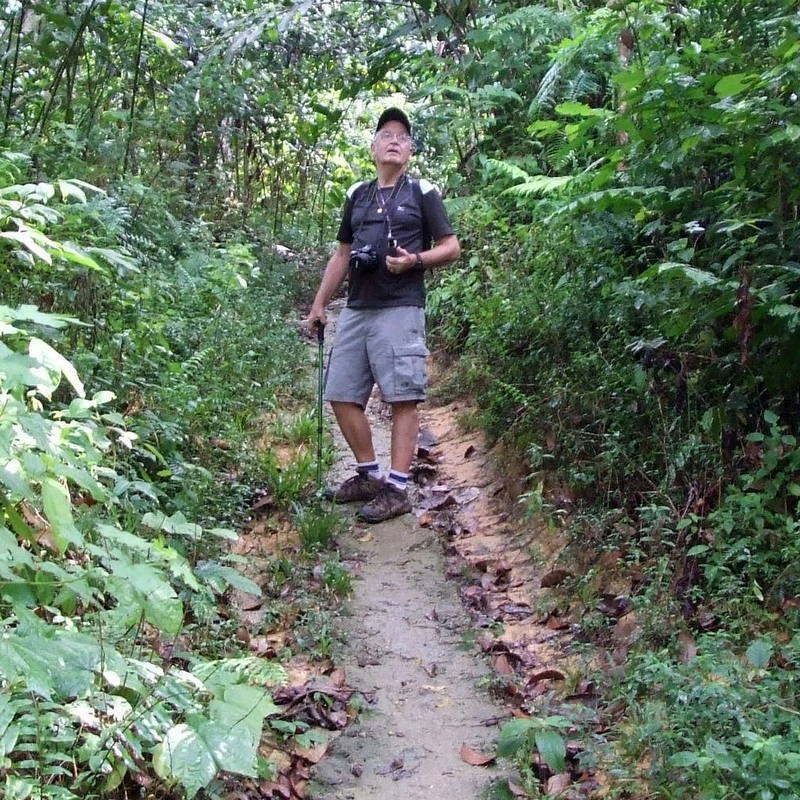 Here we are, two senior citizens in the jungle. 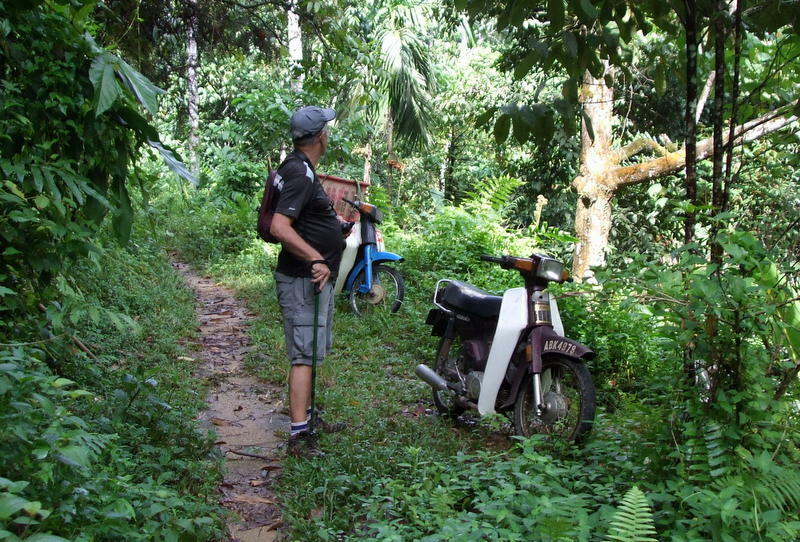 The hike took us about three hours, during which we did not meet a single soul, although we saw signs of life along the trail, a shelter here, a motorbike there. But ok, when something would have happened during our scrambling down, we would have had a problem. 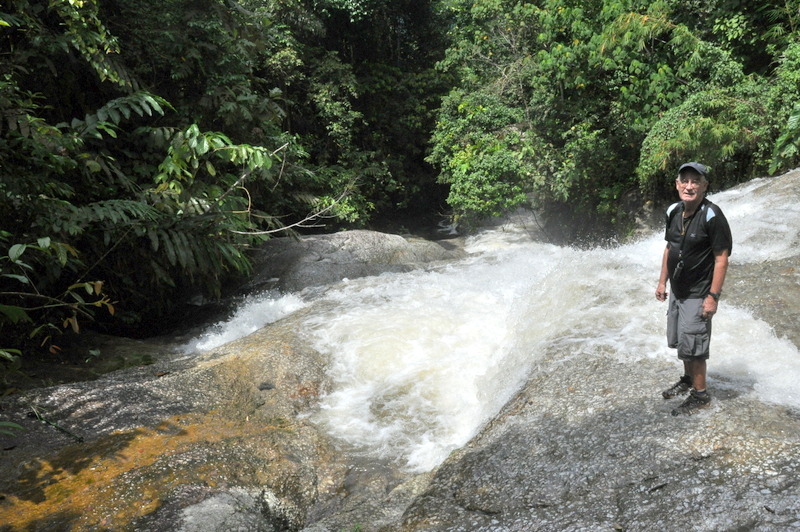 The situation has changed, after I published the Air Hitam waterfall on my website. 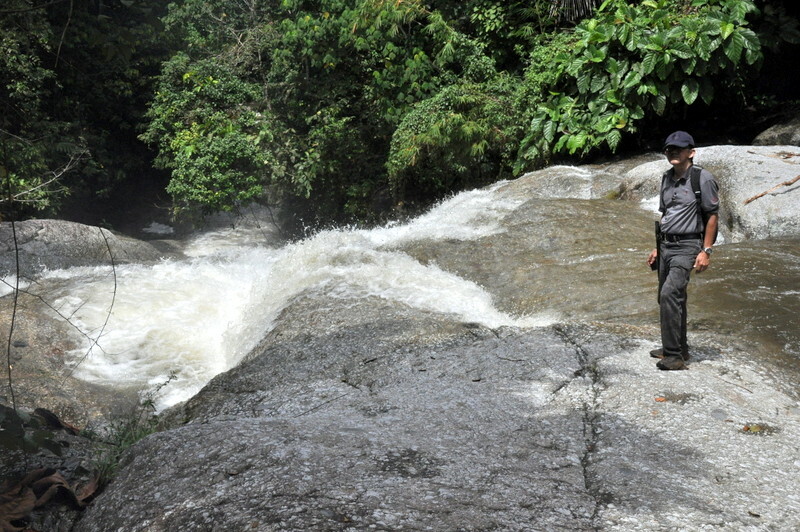 I have revisited the fall several times and there is now a clear trail leading down directly to the main fall. Fortunately the fall is still relatively unknown and pristine. 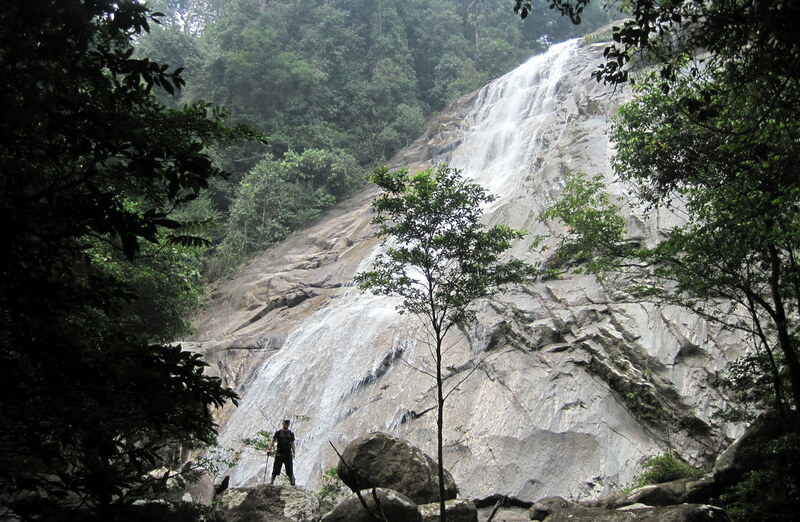 Two year later we went to the Nyior waterfall in the Bubu mountain range. A much more serious adventure. Ladang Allagar is a plantation between Terong and Beruas. Crossing the plantation you enter a Forest Reserve. 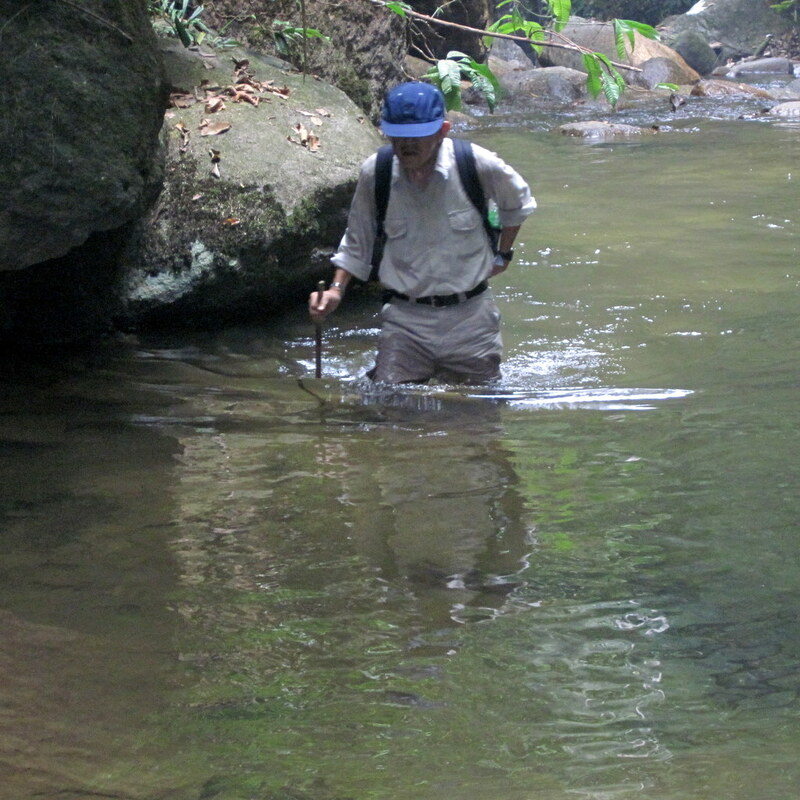 The road ends at a water catchment, where the trail starts. We stayed at the fall about one hour, enjoying ourselves. Pity there was no pool. Altogether the hike took us almost 5 hours, it was not a difficult one, again we met nobody but this time there were also no signs of human activity. If one of us would have had an accident, we would have been in serious trouble. Jan..I must have lost my mind when I agreed to go with you then. But in retrospect thanks for the memories. 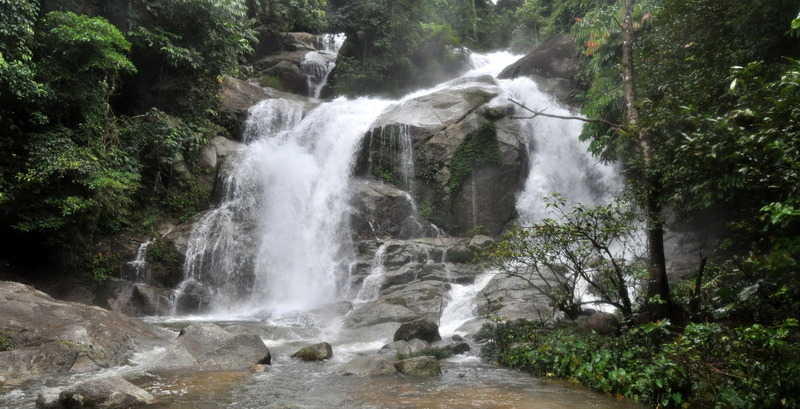 The sight of those majestic falls in their natural remote seclusion was just awe inspiring. Such power and beauty yet unseen and unknown by most people.